I like solo shows. I don’t mean the kind of solo shows in which an actor portrays Mark Twain, or Emily Dickinson, or Will Rogers. I mean the generally autobiographical monologues in which adversity, history, and selected, tweaked moments of memory are turned into theatrical experiences. Shows like that are the quintessence of the storyteller’s art. Vivien Straus has taken a segment of her own life and turned it into a solo show. Straus presents her patchwork quilt of a tale with tenderness and vulnerability. Her story of self-discovery gives us glimpses of her life on her family’s dairy farm, her flight to the freedom of San Francisco, and the inauspicious night at a dance club when, fueled by alcohol, she picks up a Czech wanderer who manipulates a one-night stand into a multi-year live-in relationship. Straus tells us, in detail, how this happened, but she never really lets us know why she let it happen. Bolie, the Czech, is portrayed as something between a borderline personality and a full-fledged nut case. One of the few times she lets slip a clue about her feelings for him is when she finds, at a birthday party, that her family likes him—and that she also likes him—before he has a drunken meltdown and curses them all out. Unfortunately, it’s difficult, as an audience member, to like Bolie or to like the female character, Vivien. Sometimes pity becomes the dominant emotion, and sometimes annoyance at the woman who would let this situation continue for years. As her man-who-came-to-dinner interloper and his erratic behavior is described, the overriding feeling is one of relief that the parasite’s host didn’t end up as a dead statistic. 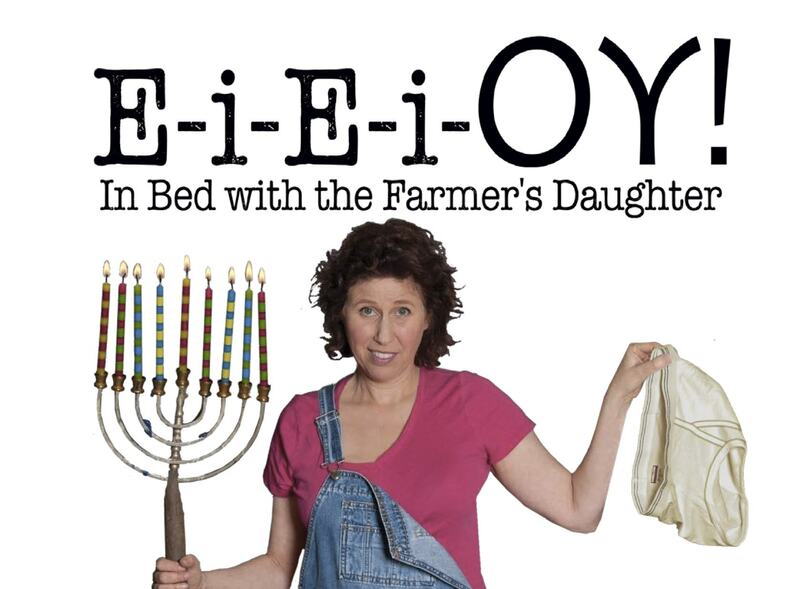 Vivien Straus presents her one-woman show, “E-i-E-i-OY”, at Theatre of Hugen’s NohSpace through May 10th. Photo credit: Naomi Fiss. Many of the work’s themes are attached externally like post-it notes. The core issue of a modern female struggling with her own liberation gets less attention than it deserves. Vivien grew up in a very restricted environment where her German Jewish father told her what to do and decided for her what was best.She was not permitted to do certain farm tasks because they might hurt her chances of giving birth to children. When her father finally figured out Vivian had never developed the courage of her convictions so that she could stand on her own two feet and kick out the “bad” boyfriend, he blamed himself for not having given her a properly grounded Jewish education. The Jewish lesson he presented was the story of Esther, who had to risk her own life to stand up for what she believed in. The theme that does get attention is animal husbandry. Straus makes constant comparisons of human behavior (particularly in the area of mating) with bovine behavior. The device works the first few times, but its repetition turns it into a gimmick. Straus is a good storyteller and a more than adequate actress. However, in this piece her craft seems to have let her down. She gives the many characters in her story physical attributes and dialects, but her portraits of them are seldom three-dimensional. An ample share of the blame belongs to director Brian Glenn Bryson. The pacing of the performance is one of the things that saps its richness. The inner metronome of the evening seldom varies—even when the actress is jumping up and down on her bed. Dan Adamsky’s sound design seems cluttered, but it is difficult to tell when the person in the control booth misses so many cues. (Example: 1-Actress looks around with a worried expression and answers phone. 2-Actress starts to speak. 3-Phone rings.) The same can be said for Sophia Fong’s lighting. Several times the actress stepped into a pool of darkness and was halfway through an anecdote before the area light was brought up. Some of the flaws may have been a case of “opening night blues.” However, the basic story is not all that interesting and no amount of good storytelling, pacing, performance, or production values will make it so. “E-i-E-i-OY! — In Bed with the Farmer’s Daughter”. Written and performed by Vivien Straus. Director: Brian Glenn Bryson. Sound Designer: Dan Adamsky. Lighting Designer: Sophia Fong. Posted in Reviews.Tagged Charles Kruger, E-i-E-i-OY!, Martin David, San Francisco Theatre Reviews, theatrestorm, Vivien Straus.